She routinely customizes presentations based on interviews with audience participants to make the content that much more relevant to those listening. The audiences consist of industry leaders, professionals, manufacturers, retailers and retail salespeople, designers, builders, marketers and managers from the home furnishings industry [residential upholstered furniture, floor covering] and other industries. Their numbers vary from 5 to 500. If you would like for Ms. Whittemore to speak at your event, simply contact her for more information via email - cbwhittemore@simplemarketingnow .com - or phone - 973-283-2424. Here follow details of the formal presentations delivered. 1/25/19 - Ask Me Anything About Blogging for Business in Flooring during The International Surface Event 2019, held January 22-25 at the Mandalay Bay Convention Center in Las Vegas, NV. 4/18/16 - "Online Visual Success with Houzz, Instagram and Pinterest" with Arpi Nalbandian at Coverings 2016 in Chicago, IL. >> See Make Sense of Houzz, Instagram and Pinterest for the Tile Industry during Coverings 2016 Session for more details. 1/21/16 - "How to Improve Your Website & Online Marketing with Web Analytics" during TISE West 2016 in Las Vegas, NV. 1/20/16 - "What’s A Hashtag And Why Should You Care?" in the Trends Hub on the TISE West show floor in Las Vegas, NV. 1/20/16 - "The Top Social Media Trends That Will Dominate 2016" during TISE West 2016 in Las Vegas, NV. >> See Learn How To Make Online Marketing Work For You At The International Surface Event 2016 for more details. 4/16/15 - A panel discussion titled “Social Media in the Stone Industry Forum” with Jared Baker, VP Marketing for Walker Zanger, and moderated by Sarah Kelly, managing director of MKG Department at Coverings 2015. 4/15/15 - "Image is Everything! How Houzz and Pinterest Steer Clients to Your Tile/Stone Business: A Case Study and Guide for Visual Online and Social Success" with Arpi Nalbandian at Coverings 2015 in Orlando,FL. 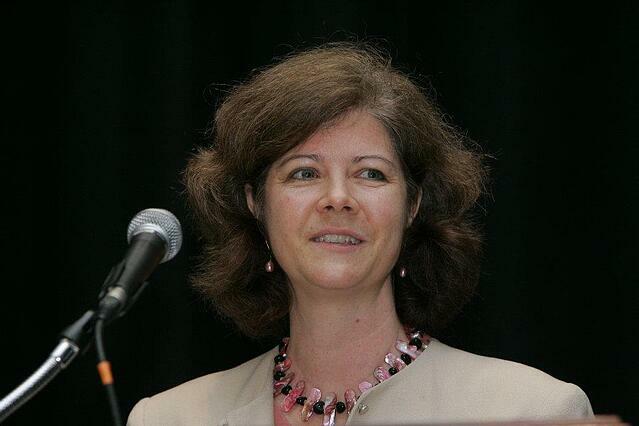 >> See Christine B. Whittemore Speaks at Coverings 2015 on Visual and Social Media Best Practices for details. Make Your Website as Effective as Your Showroom! Have You Tried Facebook Ads? Are Your Sales People on LinkedIn? Why Not? 1/20/15 - Social Media Interactive Workshop I: Using Social Media to Support Your Business and Social Media Interactive Workshop II: How to Get the Results You Want during TISE West 2015 Education Day Program. >> See ‘Get Found Online’ Focus of C.B. Whittemore’s Presentations at The International Surface Event for details. 5/6/14 - "Success Online With Crossville," dealer webinar with Crossville, Inc.
10/11-12 - Kinnelon Borough Council, presentation detailing results of discovery and proposed recommendations to turnaround Kinnelon Library financial deficit. See Staff Cuts Considered for Kinnelon Library in Patch. 1/23/12 - “Social Media: How To For Business” a three-hour workshop led by Sarah B. Johnson, managing director, MKG Department, and Christine B. Whittemore. 9/23/11 - "Getting Found Online", video presentation for Business Growth Summit, a free online event featuring leading business strategy experts, which took place September 12 through 23, 2011. 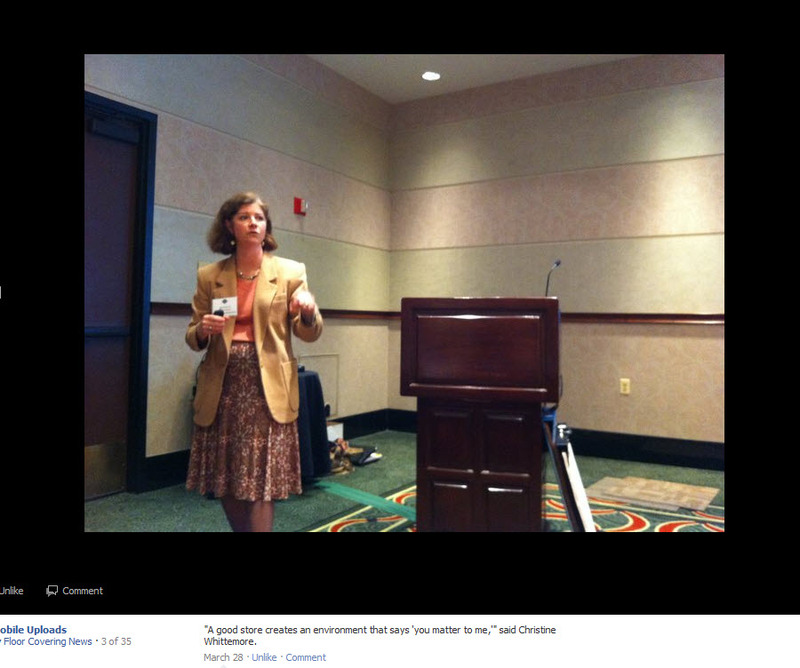 9/11/10 - Canada Nufloors Group, Kelowna, BC: "Retail Hospitality or Customer Service Before, During and After the Sale"
5/25/10 - Social Media Club North Jersey, Secaucus, NJ: "I love you. I hate you. 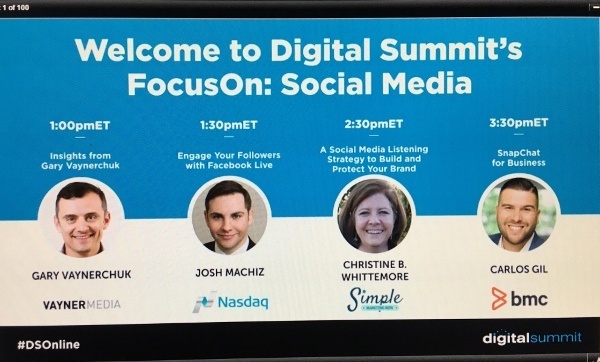 Customer Feedback in a Social World"
5/12/10 - Right Management, Parsippany, NJ: "Simplifying Social Media. For Research, Connection & Differentiation"
4/30/10 - Coverings 2010, Orlando, FL: "Marketing In a Recession 101"
4/28/10 - The Luxury Marketing Council Orlando, Orlando, FL: "Flooring The Consumer: Developing Community & Delivering Wow!" 2/2/10 - Surfaces 2010, Las Vegas, NV: "Social Media 101"
2/1/10 - Surfaces 2010, Las Vegas, NV: "Marketing In a Recession 101"
1/23/10 - Big Bog's Flooring Outlet Annual Convention, Chattanooga, TN: "Flooring The Consumer: In-Store and Online"
4/17/09 - ExecuNet Meeting, Parsippany, NJ: see "Blogs are now mainstream media." 11/19/08 - Jack Laurie Floors, Fort Wayne, IN: Color Me Beautiful, Let Color Be Your Guide to Sales Success. 11/12 & 13/08 - The WSFCA monthly dinner meetings in Seattle, WA and Spokane, WA, How To Improve Your Retail Shopping Experience announced in Wear-Dated® Presents Seminar for Washington State FCA and promoted in WSFCA's Newsletter. 11/11/08 - Associated, Seattle WA: Color Me Beautiful, Let Color Be Your Guide to Sales Success. 9/17/08 - Atlanta Flooring Design Center, Suwanee, GA, What Your Register Tape Doesn't Tell You and announced in Wear-Dated® Presents Seminar at Atlanta Flooring Design Center. 7/30/08 - Avalon Carpet Tile and Flooring, Cherry Hill, NJ: What Women Want... Women Get. 7/22/08 - Carpet One Floor & Home, Summer Convention Education Day, Nashville, TN: Color Me Beautiful, Let Color Be Your Guide to Sales Success and announced in Wear-Dated® Adds Color to Carpet One Convention. 4/24/07: Carpet Exchange, Denver Colorado: Trading Up With Carpet, Truly A New Luxury Good and Wear-Dated Fiber Fundamentals [3 sessions of each]. 3/7/07: Flooring America/Flooring Canada Winter Convention Retail Sales Professional Education Day in Anaheim, CA: What Women Want... Women Get.Announced in Wear-Dated® Seminar Focuses on Engaging Women Consumers. 2/9/07: Surfaces 07, Las Vegas, NV: Why Amazing Shopping Experiences Matter. Announced in Wear-Dated® Seminar to Discuss "Why Amazing Shopping Experiences Matter"
7/24/07: Avalon Carpet Tile and Flooring, Cherry Hill, NJ: What Is Blue? color presentation. 7/11/06 - Advance Carpet One sales meeting, St. Louis, MO: “What Woman Want… Women Get." 3/9/06 - Flooring America Winter Convention, Anaheim, CA, March 9 [2 sessions]: “What Woman Want… Women Get and described in Wear-Dated® & Flooring America / Flooring Canada Convention Seminar Focuses on Engaging Women Consumers. 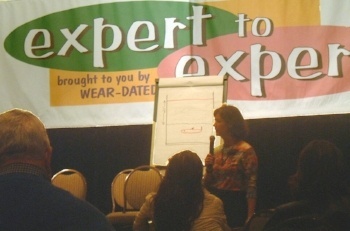 2/22/06 - Carpet One Winter Convention, Anaheim, CA, [2 sessions]: “What Woman Want… Women Get" and described in Wear-Dated® and Carpet One Convention Seminar Focuses on Engaging Women Consumers. 1/31/06 - Surfaces 2006, Las Vegas, NV: “Appealing to Different Consumer Segments by Creating Amazing Buying Experiences,” a three hour workshop described in Wear-Dated® Workshop Focuses on "Amazing Buying Experiences" During Surfaces 2006. Nov., 2005 - Wear-Dated National Sales Meeting, Pensacola, FL: “Trading Up – Carpet, Truly a New Luxury Good” and “Marketing to Women – It’s a Business Thing” - multiple sessions. Dec., 2004 - Mohawk Floorscapes Convention, San Francisco, CA: Marketing to women/Its'a Business Thing. Feb. 2004 - Wear-Dated Upholstery Fabrics yearly summit for key furniture retailers, manufacturers and fabric mills about the importance of change in the residential upholstery marketplace, Phoenix, AZ: "Expert to Expert: How to Make the Best Better/What Does It Take to Satisfy Today and Tomorrow's Consumer?" keynote address and presentation with Michael Payne. Feb. 2004 -Surfaces 2004, Las Vegas, NV: participated in CRI panel discussion about consumer trends, consisting of individual presentation about consumer trends information [purchasing habits, marketing to women, product and color trends] and then Q&A. Jan. 2003 - Wear-Dated Upholstery Fabrics yearly industry summit, Kaua'i, HI: "Expert to Expert: Romancing The Consumer" keynote presentation. Jan. 2002 - Wear-Dated Upholstery Fabrics yearly industry summit, Puerto Vallarta, MX: "Make It Yours" keynote presentation. Jan. 2001 - Wear-Dated Upholstery Fabrics yearly industry summit, Paradise Island, Bahamas: "Simply The Best" keynote presentation. 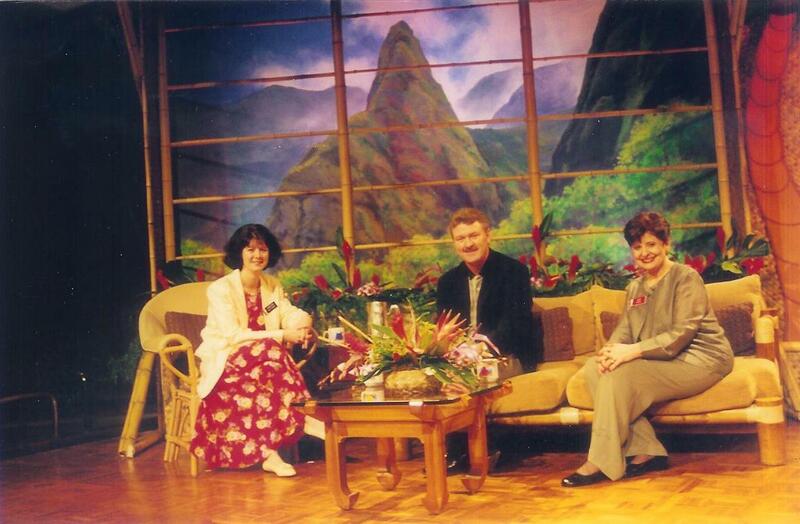 Jan. 2000 - Wear-Dated Upholstery Fabrics yearly industry summit, Syndey, Australia: "Walk In Her Shoes" keynote address and presentation with JC Penney's Robert S. Price and Kathy Wall [formerly with Klaussner]. Jan. 1999 - Wear-Dated Upholstery Fabrics yearly industry summit, Maui, HI: "The 85% Solution" keynote address and presentation with La-Z-Boy's John Case and Domain's Judy George. 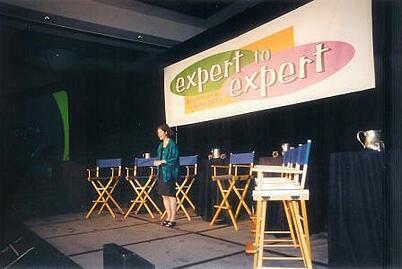 Jan. 1998 - Wear-Dated Upholstery Fabrics yearly industry summit, Oahu, HI: "The Future's So Bright" keynote address. Consider Having Simple Marketing Now Help You Start a Conversation at Your Upcoming Event. Read through our Case Studies for an idea of the types of projects we have experience in. Check out News & More. Explore the rich & engaging content we publish on our Blogs.